Well, I’ve not exactly been churning out the posts have I? Anyhoo, the season is now over and we have more time to ourselves so maybe more time for posting we shall have to wait and see. And today’s post is on the subject of time. In France it would appear there are three possible answers regarding the length of time something may take. Customer – What time will you be delivering my fridge? Customer thinks – Oh Good, they are coming today*. If that conversation takes place after 4pm it is quite acceptable to mean possibly tomorrow morning. The second time period is the stock answer when ordering anything that has to be delivered from another site. The answer is “two weeks”. Everything here is delivered in two weeks, whether that in reality means tomorrow or some time in the next year. (Usually the latter unless you are purchasing an unimportant knick-knack for your home in which case it will definitely be tomorrow). No matter how outlandish the item is you are ordering, in fact the more outlandish the better, it will be delivered in two weeks. That could be a sofa, a pygmy hippopotamus, an item that is in the stores next door. Basically, two weeks means it is something that probably exists. Customer – I’d like to order a customised Peugeot 3008 with all the extras that you have printed in the brochure? Will I have to wait long? Dealer – Not at all, it will be here in two weeks! Customer thinks – Great, as long as my present car gets through another 7 or 8 months I should be ok. The last time frame is not so much a verbal answer as the all purpose Gallic shrug. It is used when, annoyingly, they have run out of something mundane at the supermarket or DIY shop. Now, one might think that correct answer to the question, “when will you be getting more beetroots in?” would be two weeks, but no, you will receive a shrug. Now, in England, that would just equate to, “quite honestly, I couldn’t give a monkey’s and if you think I’m going to walk to the other side of the shop to find out you’ve got another think coming!”. In France they are much more helpful with the use of the shrug. What they are actually telling you is that, “Yes, I apologise profusely on my own behalf, that of my family, the company and the regional government, it is most annoying that we don’t presently have any. If only I had beetroot at home I would bring you some round from my very own kitchen. We have ordered some, but you must understand that the beetroot farmer is having a hard time of things and almost definitely he is presently blocking a road somewhere near Paris in protest that a shop somewhere near the Swiss border has sold some beetroot sourced from an entirely different country. The farmer should be back tomorrow as he has a flight booked so he can get back quickly, however, the air traffic controllers are possibly on strike as the government refuses to stop all planes flying in French airspace during lunch hour, (12-2), and how is a poor Frenchman to survive if not taking in a three course meal with coffee, cheese and biscuits, in the middle of the day?”. The shrug has conveyed all that and you then have to take a considered decision whether one comes back tomorrow as the shelves will be full of the beautiful purple stuff again or give up beetroot altogether as it unlikely ever to be grown again in France. There is no alternative to those two extremes. Customers 1 and 2 – Can I order a further 1 metre of the plinth for my kitchen you kindly supplied earlier this month? In-house Kitchen Designer – Certainly, we will order it today as the warehouse doesn’t have any left. Customers 1 and 2 – (panic, hoping the answer coming up will be two weeks) And when will it be here? Customer 1 – returns next day, still not in, and the day after, not yet, everyday for the next three years…….. Customer 2 – accepts his fate and rips out his new kitchen, the following day purchases a brand new one (all except the final end board for the run of cupboards), gets home and receives a phone call from the helpful guy in the warehouse to tell him the good news that they have just found one metre of plinth for his kitchen. Should you ever find yourself in France I hope the above will be helpful. And just to let you know I will be posting another article here shortly, almost definitely in two weeks! First Anniversary – 20 Things I’ve Learnt. So here we are, one year today since we arrived in Loupia to start our new life. Here are 20 things we have learnt during that time. Yes, the croissants really are a million times better than anything you can get in the UK, even at Paul which is a French chain in the UK. Despite being our traditional enemies the French are a very friendly bunch of people and have accepted us because we have tried to make an effort to integrate. (Exclude Parisians from this comment). Looking after swimmming pools has been highly enjoyable once I got my head round the fact they are temperamental buggers who can’t be trusted! (Include Parisians in this comment). French electricity, water and tax systems are beyond any understanding. It’s cheaper to visit the doctor here and get medicine in a paid system than it is to visit a doctor and get medicine in the free NHS. Again, on the whole, French drivers are very good, considerate, and that includes motor cyclists. (Once again, exclude Parisians from this comment). If you are ever re-incarnated as a duck, do not land in Southern France. You will be cooked within minutes! The cats we seem to have adopted totally ignore us both in French and English. We have bi-lingual cats!! French TV is worse than French pop music! If you want to live in a place where everyone tries to do their best for their commune and in so doing receive the same amount of respect be you an owner of a multinational company or a bloke who just works on the vines, then this part of France is for you. As you will have seen from the news, the French will strike over the littlest thing and would picket their own mothers funeral if neccessary, but between the hours of 12 and 2pm all that is forgotten because it’s lunchtime, and who has time for a life so militant that you can’t have a three course lunch! Don’t piss off the Mayor because you won’t even get permission to change your door knocker if you do. It’s rare to find anyone working in a shop who isn’t happy to serve you and be friendly. If you want to book your car in for a service don’t just think you will be popping in to get a day and time, they want to know what is wrong, what might be wrong, and to check what they think is wrong. That way they can make sure they have all the parts when you finally take it in. Wine is cheap, plentiful, and it’s bloody difficult to find a bad one. If you like meat you will love butchers and the butchers counters of supermarkets, they have proper cuts of meat that look like the thing they are meant to be. A shoulder of pork looks like a bloody big chunk of pig. The French can’t make sandwiches. It is beyond them. They don’t even seem to grasp even the basic concepts. There are only four flavours of sandwich and they pretty much all taste the same. The kids are well behaved. I like living in France. Well, this has been a bit of a gap hasn’t it? And so much for the daily picture! Winter down here, which was meant to be our quiet time, has still given us enough work so we don’t get bored, or to let us get very far with our plans to do work on the house. We have got a new kitchen going in although it is taking longer than we expected. Don’t they always! The weather was really good until the New Year and then we started “winter”. In the village that tends to be rain but our view of the Pyrenees has got progressively whiter. The last couple of days were rather warm and sunny, almost getting to 20°C but today the rain is back and it was meant to stop by the end of Feb! Everyone has their shutters across the windows which help keep the warmth in but make the village look deserted, so other than occasionally seeing close neighbours, it seems very quiet. It does feel as though the whole area is hibernating. I was back in the UK last month for a week in order to qualify in pool management to help with the job over here. I passed the exam part whilst there but I am awaiting the assignment part to be marked. In the end I did it for the information I gained but it would still be nice to actually pass the course. Fingers crossed. We are going to be going to going to a French conversation group of a Friday evening in order to improve the language skills, which I particularly need to do. We do an hour and then head off to the local bar, (it is all in the next village of Villelongue D’Aude). The bar is exactly what you would expect, a tiny little place which looks remarkably like it was the inspiration for Allo Allo, made all the more so by the fact we go with our next door neighbours who are German. The prices are somewhat cheaper that we were used to in London – two glasses of red wine and two beers came to 5 euros, about £4. Back in the UK again soon for Laura’s wedding, (Marj’s daughter), then when we return it will be time to start opening the pools and putting my new knowledge to the test and also spring cleaning the houses before the season starts. It’s hard to believe we have been here 9 months already. Sorry this reads somewhat like a round robin letter but hopefully, as we wake up as Spring takes hold, there will be more to blog about. There isn’t always time to blog, as you may have noticed, but if I get my act together I can try and post a photo each day on my photo blog. It has been dormant for a bit, and I can’t promise to make it daily, but for those who want to dip in now and again I will try my best. Well we keep thinking it is all slowing down and, compared to the madness that is July and August, it has, yet every day seems to have some work that needs doing. So amongst the bits of work we try to move forward with day to day living. Today we “registered” with the doctor. As one imagines the whole health process is a little different here to the UK. There is a centralised health service whereby you pay your cotisations (subscriptions) to the RSI and these are the equivalents of National Insurance. In exchange you get a percentage of your medical, optical and dental services paid for. Typically somewhere between 70% & 80%. In addition you can take out medical insurance to cover yourself for the balance plus, if you want, an overpayment whch covers you for 120%. The latter means that there are an extended range of glasses, medical services, etc that are “free”. The first thing you do is find a Mutuel. This is a company who handle all the administration of your medical events. Having done that, and in advance of receiving our Carte Vitale, (Health Card), you can visit a doctor/dentist/optician. You don’t register with a doctor until you are either ill or in need of medication. As we needed some of our tablets we headed in to see the English speaking Belgian trained Algerian doctor in Limoux. Actually, I’ve jumped the gun, as we rang yesterday evening at 6pm to see when we could get an appointment. We had a choice but went for 10.30 this morning. First surprise, we didn’t have to wait 3 weeks for a routine appointment! After a bit of form filling we went through the medical history and then he wrote out a prescription, or at least printed an A4 sheet which contained both the prescription and a duplicate for our records. In France one holds one’s own medial records. The reason for which later. So, all the social niceties and medical work completed, I paid across my 23 euros. (£16.50 approx). I will get 80% of that back from the RSI as soon as I send the form in the doctor gave me. The balance from the private insurance. Next, across to the pharmacy. The pharmacist took the prescription and got the tablets in about a minute, no need to hang about. That cost me cents short of 15 euros, (£10.71). Again, I will receive 80% back when sending off the form the pharmist gave me. The balance again from the insurance. If someone chooses not to pay for private medical cover then we are talking about a doctors appointment for about £3.30 and a prescription for £2.14. Just over a fiver all in. When the Carte Vitale turns up we won’t have to pay everything 100% up front, some services will just charge the 20% balance or whatever isn’t covered by the RSI. Back to carrying your own medical records. The reason is that here, if you need to see a specialist, a physio or other incremental service, the doctor just writes you a prescription stating what treatment is required and you can go to any specialist/physio/whatever that takes your fancy. You aren’t confined to a geographical area. Thus, you go along armed with all your records in case they need a look. Now we will just have to see how quick they are at refunding the money! Welcome to the first of my local restaurant reviews, with apologies to my step-sister Steph who was dreading seeing pictures of decent French food and not being able to eat it. La Tantina is on the main square and needs booking of a Saturday night, in fact most nights during the summer season to be on the safe side. Appearance-wise it looks nothing special. If anything it looks quite basic compared to others around the square. But one doesn’t go to La Tantina for the decor. 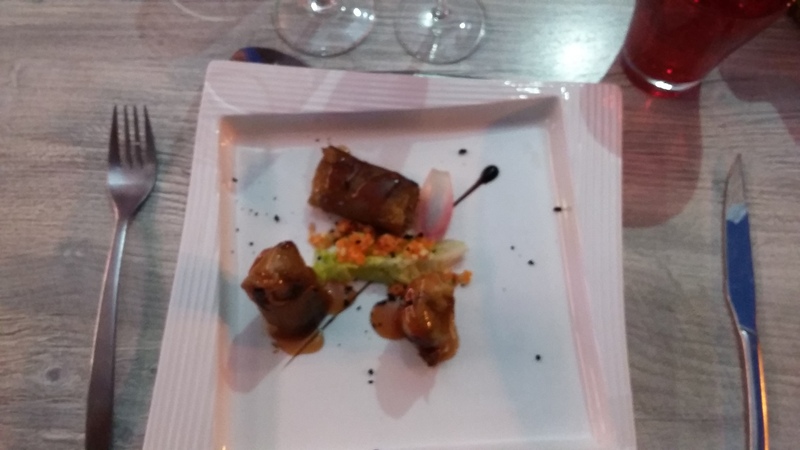 It is perhaps the first restaurant we have found that could be described as nouvelle cuisine. I have no idea where the chef came from but he was a great find. Actually, I do have an idea but that might be part of another review so I’ll leave until then and see if I can confirm my hunch. We have actually eaten here three or maybe four times now and I find it difficult not to always have the same starter and dessert. The main course I change. That would be duck spring rolls to you. They taste slightly different each time I have them, as freshly prepared food should, one time a little curryfied, whilst another a more honeyed note. Whichever slant it has they are absolutely gorgeous. Even the lettuce and carrot that they serve with it add an extra depth of flavour far greater than the sum of the parts. Served warm, rather than hot, they are crispy and don’t scrimp on the amount of duck within. My first outing with the pork, having, on previous occasions, gone with partridge, cod and a burger the first time we ate there way back last Novemeber on our first visit to Limoux. The pork, whilst not large, was tasty and the jus complemented it well. Served with a roasted aubergine slice, a vegetable I can do without, and a quarter of mushroom, again, not a vegetable I eat, so both were left. Well, I tried some of the aubergine with the pork but the sliminess of the aubergine did nothing to enhance it. The carrot baton worked well with the puree, which I took to be butternut squash but may not have been, and a further white puree of indeterminate flavour. It did taste better than I’ve made it sound but it was nothing remarkable, which may be why I keep changing the main course I go for. This photo does not adequately express how good this dessert is. Nor does the name creme citron. 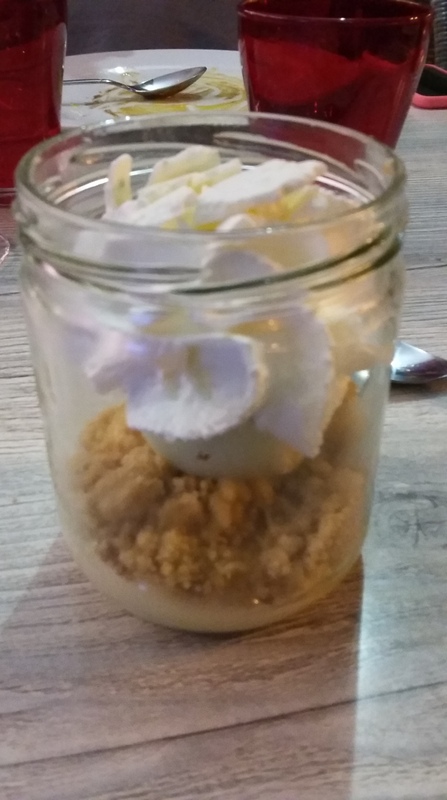 Served in a screw top jar, it’s a sort of deconstructed lemon meringue pie crossed with a crumble. Starting from the bottom you get a layer of light lemon curd topped with a layer of crumble, then follows a scoop of lime sorbet, some meringue and topped off with the favourite French dessert ingredient, Chantilly cream. The cream aside, each of the other ingredients is an intense flavour, and the whole is a rich satisfying pudding which finishes a meal splendidly although if you haven’t left room for it you are going to struggle! A blanquette to start from Anne de Joyeuse, a merlot to accompany the main course from up Beziers way and as always, a carafe of water from the start served with baskets of bread during the first two courses. 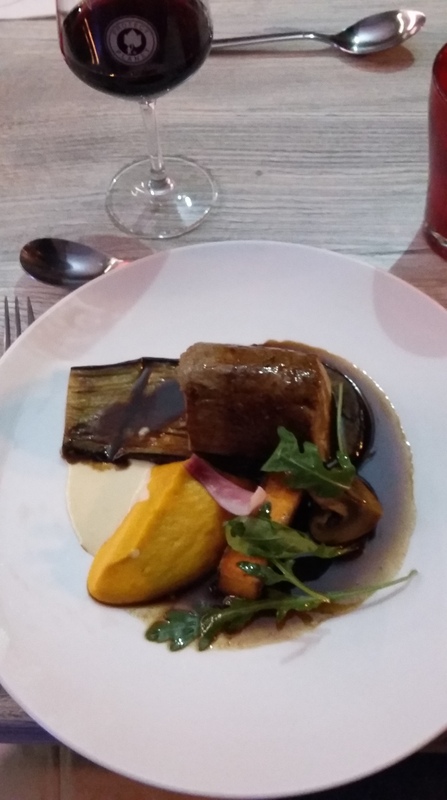 The food came to the equivalent of about £18.00 per head for three courses, slightly above average on the square for a formule, but better value than the lesser priced menus elsewhere. That’s the other thing* the French like. Acronyms. Every sentence or so on the course there was a list of acronyms. I’m not certain they didn’t say a sentence and then write it on the board as a list of initial letters just to help. It became confusing at one point because we live in Loupia and they were using the acronym L’UPA which with the french phonetic language means they both sound the same. It took us some time to realise they weren’t talking about our village. They were trying to explain the different set ups for the self employed, (there are five as best I can tell), and the options with each, all of which were acronyms. The board looked like some horrific algebraic equation and held about the same amount of interest from my point of view, or should that be POV. If I never see another acronym again it will be too soon! * For the other thing, read a million other things.